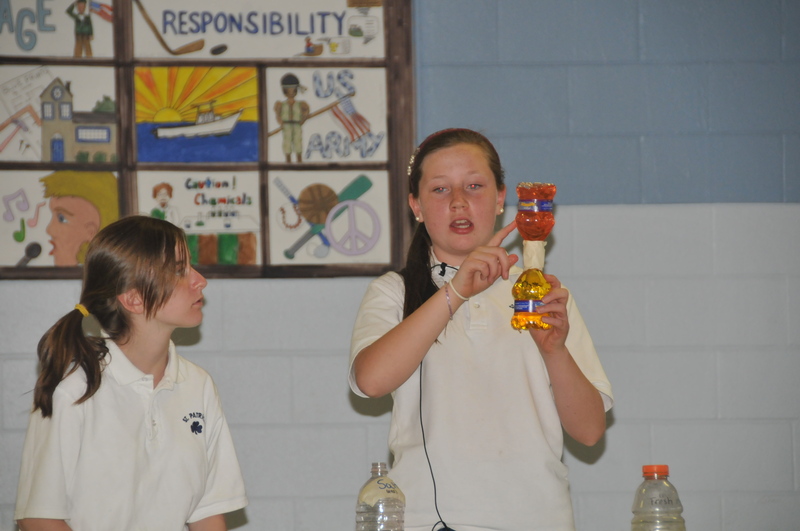 St. Pat’s 7th graders have been doing a bang up job demonstrating their science experiments to the entire school. 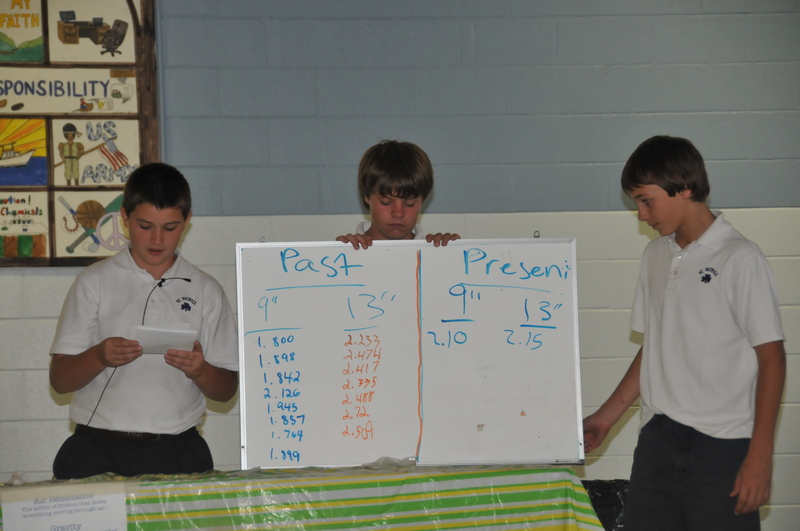 For the past few Fridays, our 7th grade scientists have been performing their experiments, sharing their data, and encouraging lots of audience participation! 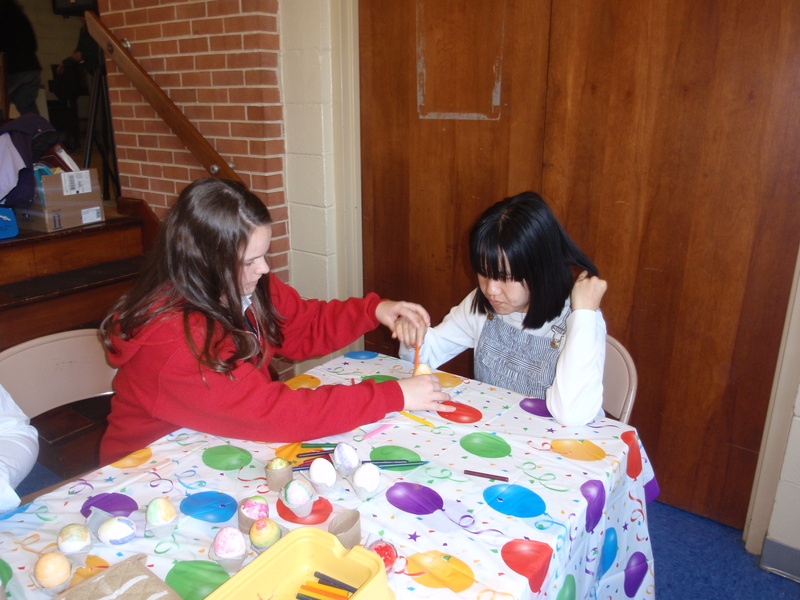 We have seen a variety of topics explored – chemical reactions, air pressure, and biology, just to name a few! Our Friday afternoons have been enlightening and we are learning a lot about science. Thank you, 7th grade! Go Warriors! Congratulations to our elementary and junior high school Reading Olympics teams for doing an AWESOME job at this year‘s competition! Our student teams combined read a total of 82 books, close to 20,000 pages, and more than three million words, all in addition to their daily school work. WOW! The students met one time per week this winter to discuss the books, answer questions and help one another to review facts. Each student committed to reading certain books and became experts on them. We learned a lot in a short time. Diligence and teamwork were the keys to our teams’ success. Most of all…THEY HAD FUN! 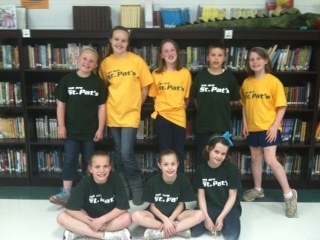 St. Pat’s team spirit and comradery were apparent at the competition as our students were the first to high-five a teammate and shake the hand of a competitor. 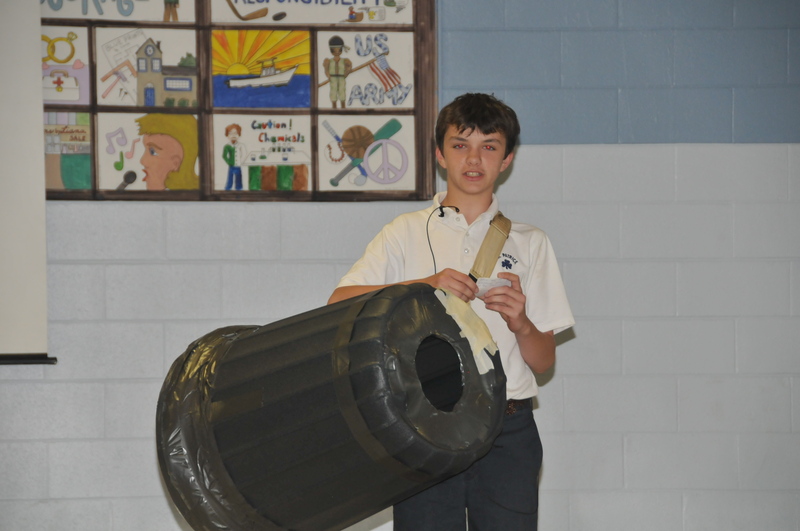 We joined more that 1,800 are students and 170 teams from local private, archdiocesan and public schools. Congratulations Reading Olympic Teams – You ROCK! Go Warriors! This Is What It Is Really About! Today I walked over to church to pick up a book. While I was there I thought I would make a quick visit since we have the wonderful privilege of having exposition all day long on Monday. 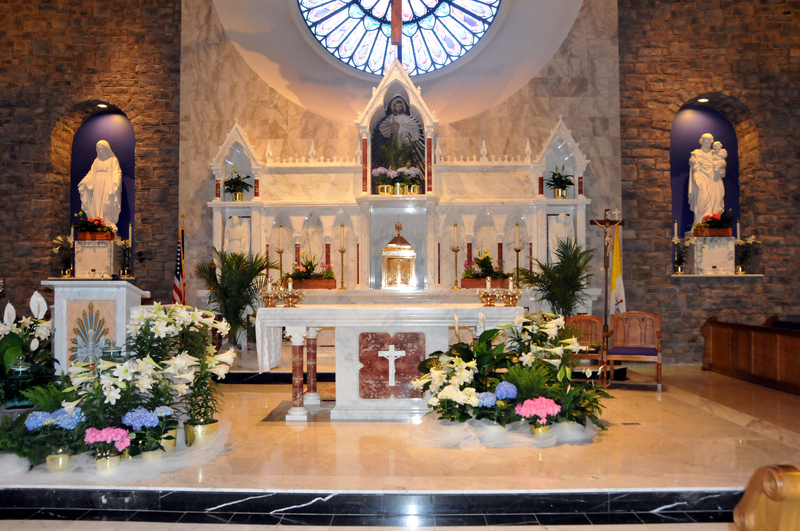 I walked into church and tears immediately came to my eyes – there before me I saw one of our 6th grade classes and two of our 2nd grade classes kneeling before the Blessed Sacrament. There was such a feeling of holiness and prayerfulness when I walked in – it was a powerful moment! As I gazed at some of the students’ faces, I just saw calm and peace. I have no idea what they were thinking or saying in their quiet prayer, but they seemed close and connected to Jesus Christ. How lucky are we that our children have this opportunity – that we can take a few moments out of the day to kneel in the presence of God? 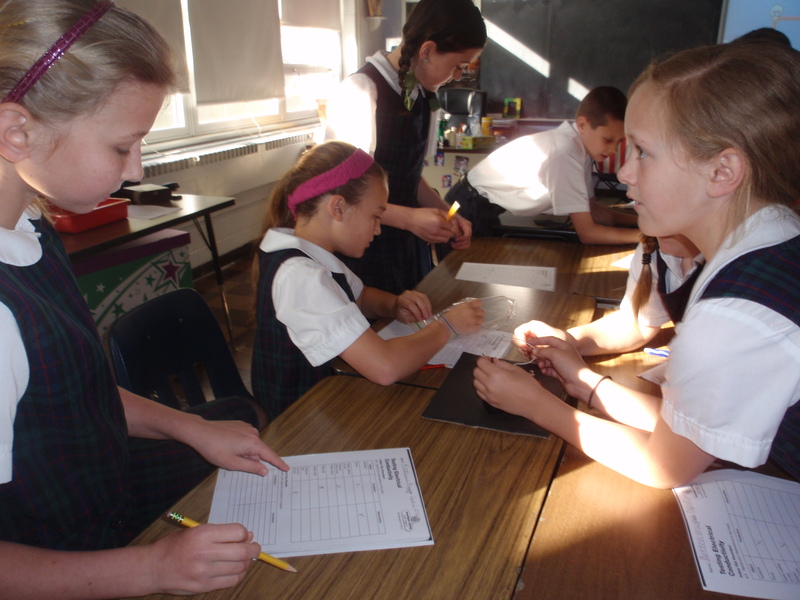 — One of the awesome blessings of a Catholic School education! 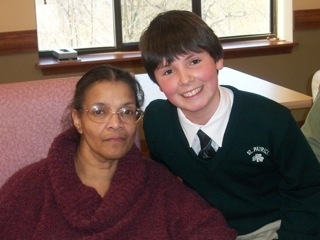 St. Patrick School 6th graders went to Chester Valley Nursing Home to bring some Easter cheer and smiles. 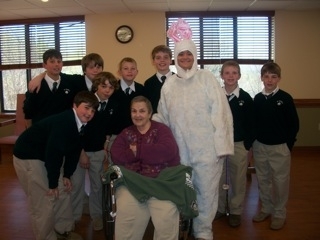 While they were there they visited their pen pal friends and gave them homemade decorative bunnies to brighten up their rooms. 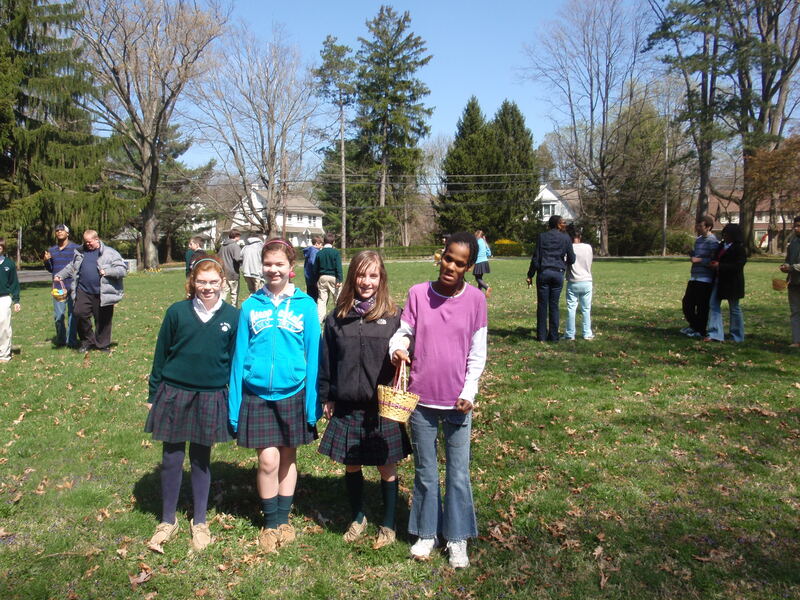 The 6th graders spent time talking to the residents and then invited them to participate in an Easter Egg Hunt. The afternoon wrapped up with a tour of the rehab facilities and promises to visit again before the school year is finished. Great job, 6th grade! Go Warriors! 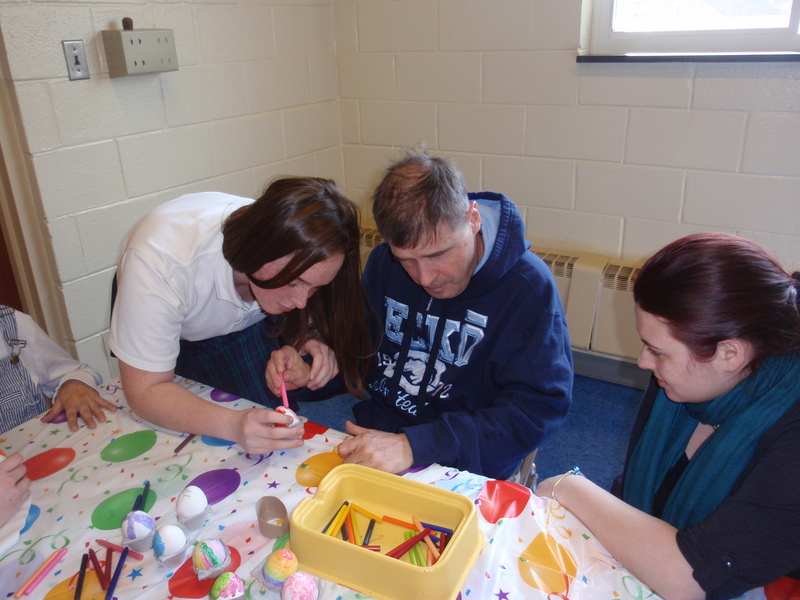 The Royers Greaves facility helps blind children and adults learn how to read braille and adapt to their surroundings. Their youngest student is 7 years old and the oldest is 21 years old. 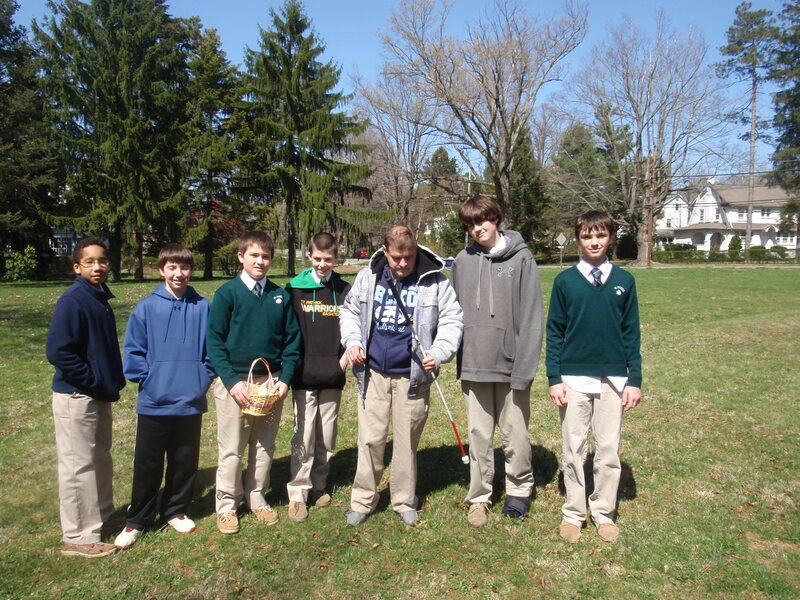 St. Patrick 7th graders helped with an Easter egg hunt, decorated cookies and hard boiled eggs, and talked, sang and listened to the musical entertainment that the students provided. 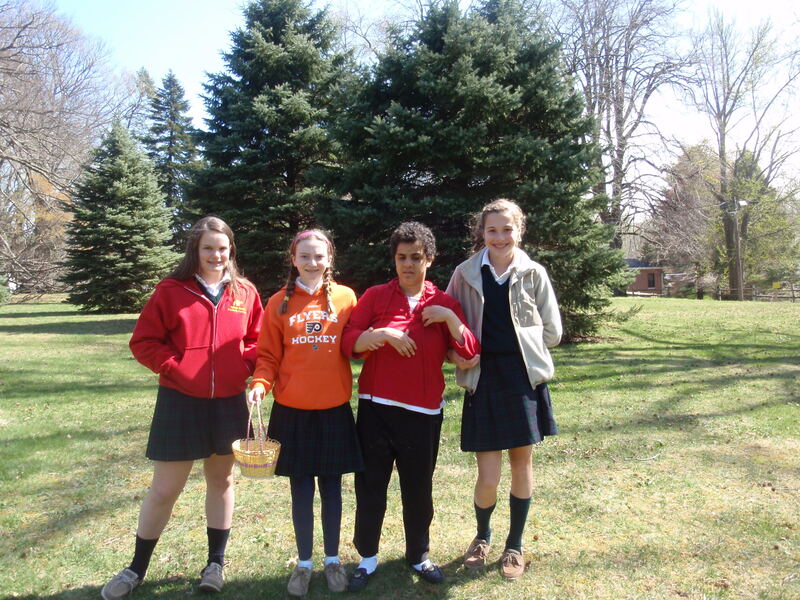 Kate and Erin stated that for the Easter egg hunt, the students were able to find the eggs because they beeped when a person was close to them. Erin said that she was nervous at the beginning but the longer she stayed, the more comfortable she felt. Kate said she was scared at first, but after an administrator from Royers Greaves explained the program, she began to feel more at ease. 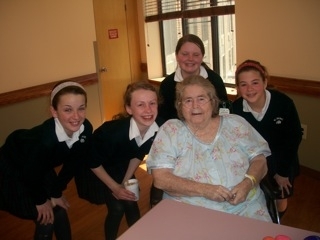 Both girls, as well as the other 7th graders, were grateful for the experience to help others. 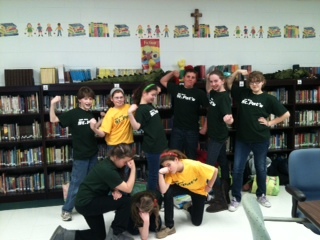 Great job, 7th grade! Go Warriors! 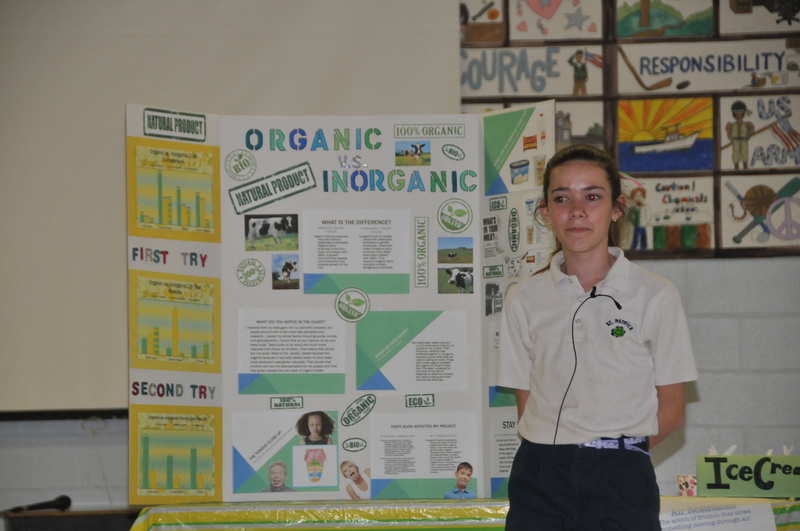 We have some real scientists here at St. Patrick School! 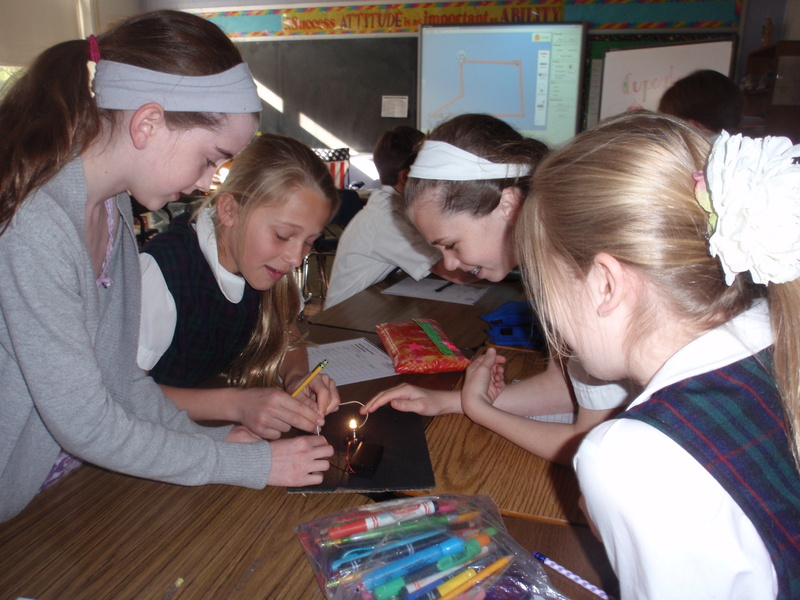 The 5th graders are learning about switches and circuits. They began the learning by setting up circuits using a website on the Smart Board. 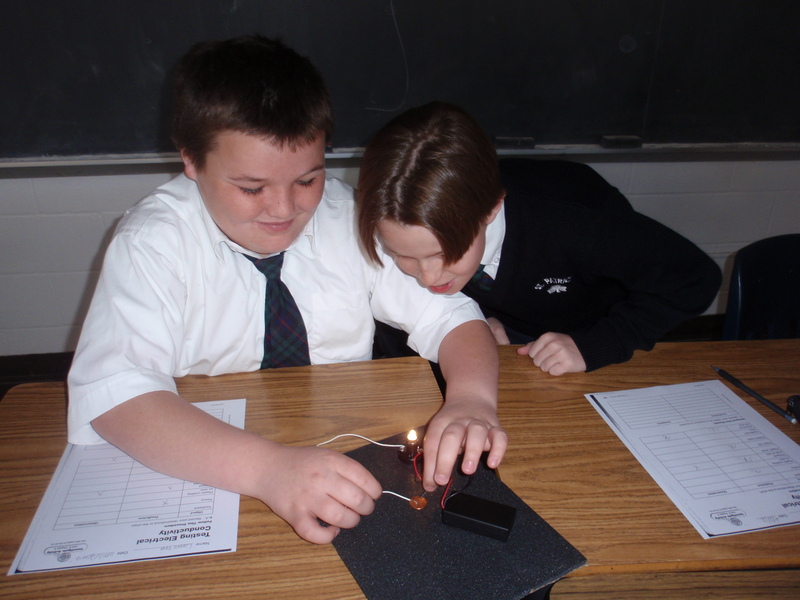 After practicing, the students were able to construct their own circuits with light bulbs. 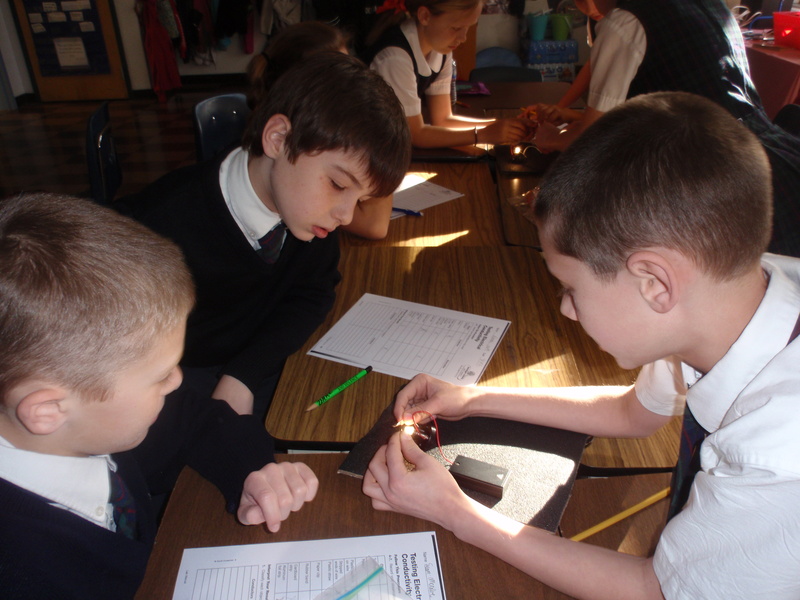 St. Pat 5th graders used different kinds of conductors – paper clips, aluminum foil, a penny, and a wire to make the light bulbs shine brightly. Great Job, 5th Grade! Go Warriors! !